So the first thing I did was to rip out the counters. All you do is open the lower cabinet doors, stick your head under there, and look up. You'll see the strips of wood that the counters were screwed/nailed to. Just unscrew all the screws, and you'll probably need a crowbar/chisel and a hammer to get it free from the wall. Try not to punch too many holes in the wall though, since there's electrical stuff behind the drywall, yo. Whoever thought that a 6-inch deep sink was suitable for a kitchen people are actually going to use?? Ugh. I would turn on the water full blast, it would hit the bottom of the sink, and then splash up and over the counter, running down the front of the cabinets to the floor. Awesome. Now to build new counters. I got some sheets of 3/4" plywood, and cut them to 25" depth. 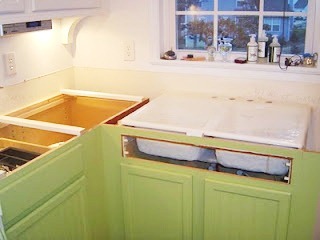 I slapped them down on top of the wood strips that the original counters sat on -- and nailed them in place. 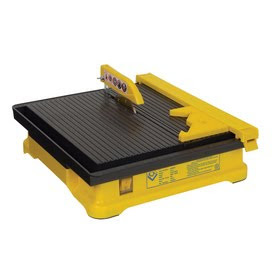 Now this is kinda tricky, because you need to make sure that you have enough wood blocks supporting the weight of the tile, because you don't want any sagging or movement! I also had to install the base cabinet by the dishwasher, and shim everything so it was level. awesome shim job, yo. I used some wood glue. If you've got more than 5 bucks to your name, go buy yourself some wood strips and cut them for blocking underneath. 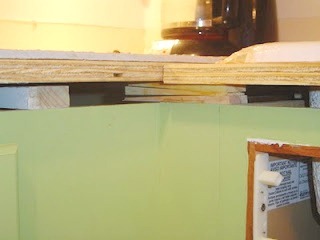 I didn't want to spend another dime so I was using whatever wood was lying around; in this case it was leftover shims. If you watch the professional tutorials, they will instruct you to cut little strips of cement board and glue them along the front edge (where you'll place the edge tiles). I did not do this. 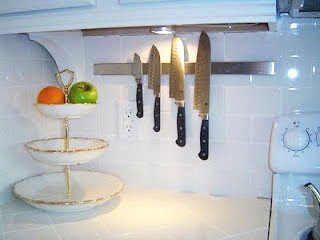 I thought it was unnecessary (ha ha) and plus cement board is absolutely evil. I had to cut it with a saw and it's the most dust-choking, blizzard-inducing mess I've ever seen. You would need a gas mask to cut tons of little strips for the front edges, and I wouldn't do it. 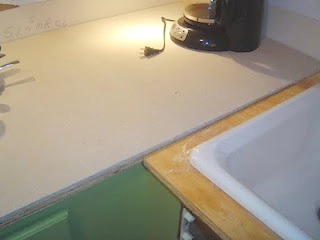 The professional tutorials instruct you to score the cement board with a utility knife, and then "snap" it along the line. Let me tell you what a lot of crap that is. Cement board is much harder to score than drywall, so I had to use a saw. And it was horrible. And it's difficult to cut lots of fancy angles on this. This saw was $68.00 from Lowe's and it works for me, though. You just have to get used to it. 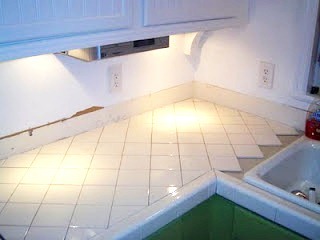 Make sure you lay the tile FACE DOWN when running it through, because otherwise you'll chip the good side of the tile. Trust me on this. When I started the backsplash, I needed to make sure that the first row was level on the wall, NOT riding on top of the counters... since nothing is ever perfectly level. 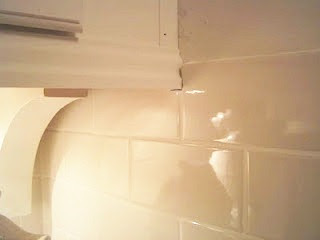 You tile the first row to the level line -- and cut it to fit the counter if need be. take off the outlet covers, too. You can shut off the power but I like to live dangerously. When you glue down the tile, use a knife and butter the tile like you would a piece of bread. Then smoosh it around a little so it's nice and stuck...and you're going to have to scrape off the extra that squirts out. You need the tiles to all lay flat against the wall, so periodically check to make sure you're not buttering some tiles more than others. 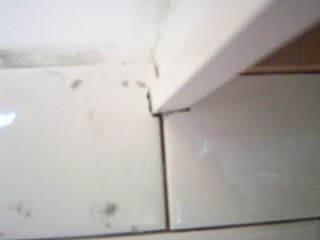 Each tile has to lay flush with its neighbors! 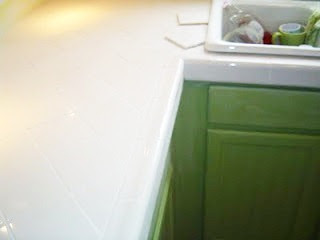 I wasn't using spacers because I don't like big grout lines -- just smash them as close together as they can go. They are manufactured with little "nubs" around the edges to give a uniform small grout line. 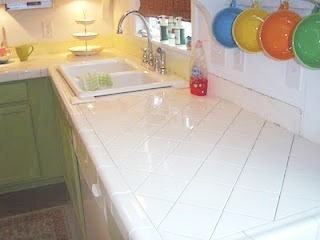 see how the line along the bottom (sitting on the counter) isn't uniform? (This is before grouting) I was tiling to a level line to make sure it's straight, and once you grout that will be completely invisible. Inevitably there will be places where you need to make weird cuts. Take your time and measure each part, sketching it on the back of the tile with a pencil. You WILL make mistakes, so expect some tiles to be wrecked before you get it right. Once the mortar has set overnight, you should be ready to grout. You mix your grout with water according to the package directions, and then you've got to move quickly. Spread it with a squeegee or a grout float. 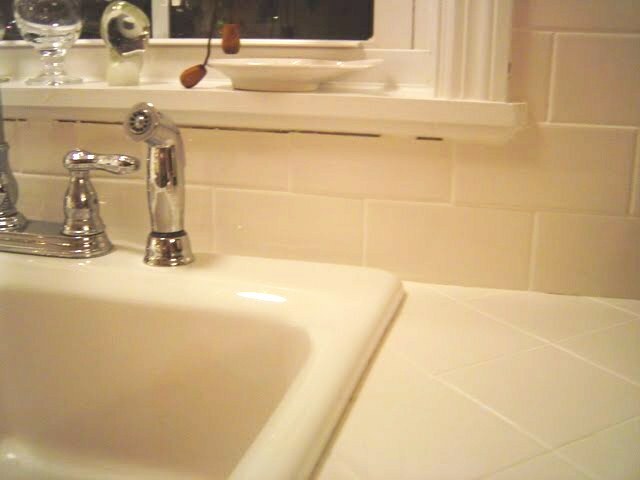 I found that I couldn't get to the spots behind the sink/faucet, and some of the edges around the shelving. I had to just use my hands and go at it -- because it sets up fast! 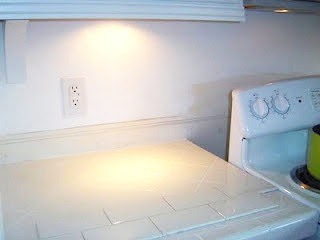 As soon as it sets for 10 minutes you have to start wiping the grout lines with a damp sponge, to get the excess off. but again, kittens -- caulk makes everything pretty! Worry not! Did you make it through this gigantic post? If so, do you want to see what the kitchen looks like now? 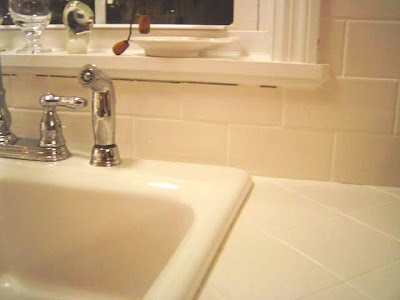 You should tile around the sink opening and then install the sink afterward. I couldn't do this because I needed to have running water in the kitchen and couldn't wait. So I hooked up the sink and then stuck some tiles under the edges to hoist it up...and then tiled underneath it. It was awkward and not the best way to do it. 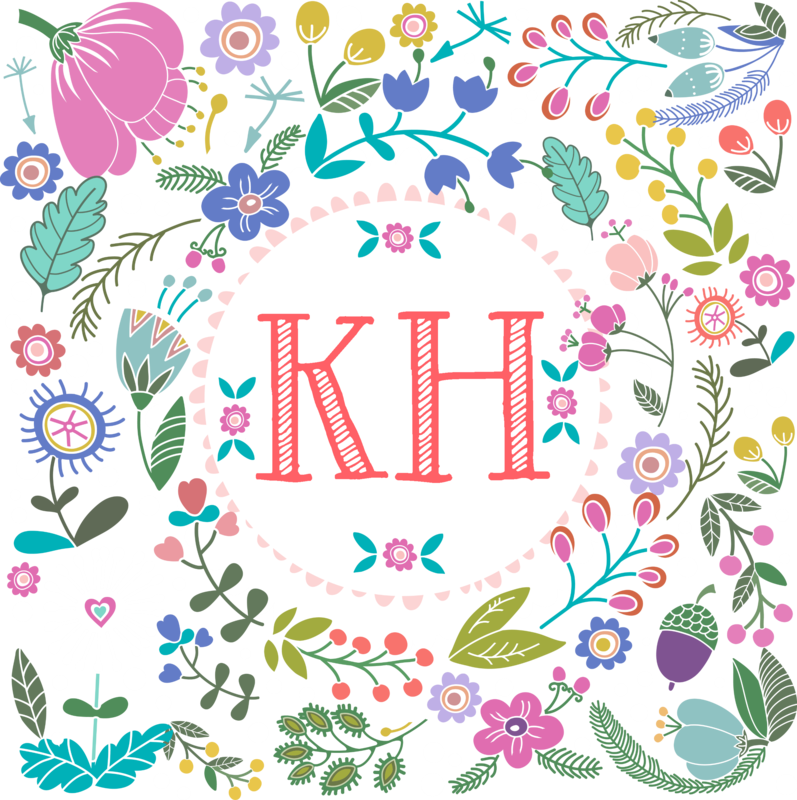 Should I add a cost breakdown? The plywood, cement board, mortar, grout, and all of the tile added up to about $300. But this is a very small kitchen. 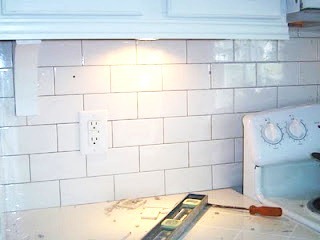 Would have been less but I wanted subway tiles for the backsplash and they cost a bit more. It really does look awesome. I love this look! Thank you so much for posting this! I love it! I think I might try to tile the horrible ugly counter in the basement bathroom as my practice run, and then go from there. 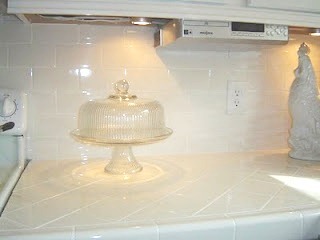 By the way, where did you get your subway tile from? And does it come in sheets or is it single tiles? Home Depot sells it in single tiles, you can buy by the box. I looked everywhere for subway tile and Home Depot was the cheapest. This looks great! 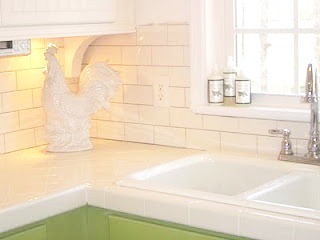 The subway tile was a good choice. Thanks for the tips! I have rounded front edges. Would that be difficult to cut off to make them square so that I could tile over them? I think you can tile over rounded front edges...depends on what kind of edge tiles you're using, and how thick the cement board you use on top...but if it's laminate, it's easy to cut with a circular saw too. I think you have done an amazing job with your kitchen.The counters look heavenly and the shortcuts you have taken are guidelines for us who don't know about it at all. Wow! You did an AMAZING job. I love everything. I've wanted to try tile for a long time, but I am afraid of it. I think it's the wet saw that intimidates me. 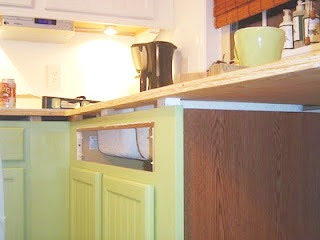 :-) I also love the color of your cabinets. This is just a beautiful makeover. Thank you for the kind comments you left on my own kitchen makeover. I appreciate everyone's encouragement.